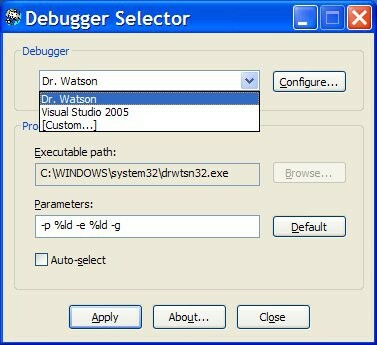 Debugger Selector 1.2 free download. Debugger Selector is a utility aimed, primarily, at software developers. It allows the developer to decide how to process an unhandled application exception which would, under normal circumstances, be processed by Dr. Watson or a specifically defined debugger. Debugger Selector allows the developer to define a number of tools that can process these exceptions and decide, at the time the exception occurs, which would be more suitable to use. The developer can define the tools that are available either in advance of the exception occurring or, for greater flexibility, at the time it happens. Define an unlimited number of debuggers. Decide how to handle an unhandled exception, when it happens. Define a new debugger to handle an exception, when it happens. Invoke a specific debugger after a user defined timeout. Pause and resume the timeout. Quick access to the Dr. Watson configuration. Deploy in 'live' environments to tailor the capture of unhandled exception information. Debugger Selector (DbgSel) is a program that allows developers to easily switch from one debugger to another. Exception Wizard is a debugging tool for programmers, created to assist in the debugging of 32-bit Windows applications created with MS VC++ 6. Run-time Exception Dumper is a powerful library tool linked to your delphi applications and placed between operating system and Delphi kernel libraries using the most advanced low level interception techniques. SQL Debugger will help you to rapidly identify any errors by stepping through code as it executes. PEBrowse Profession Interactive is a very powerful, versatile, and customizable Win32 user mode debugger/disassembler. When a dll or exe file is signed with strong name keys, .